Project partners: University of Pavia, Thales Alenia Space – Italy S.p.A., Società Metropolitana Acque Torino (SMAT) S.p.A., AVIOTEC S.p.A., ALTEC S.p.A., University of Rome Tor Vergata. Project contributors: ARESCOSMO S.p.A., Kayser Italia S.r.l.. The PERSEO project aims at the construction and test of a demonstrator for a personal radiation protection device, in form of a garment, to be worn by the astronaut in a space habitat to mitigate the harmful effects of cosmic radiation, in particular during solar particle events (SPEs). 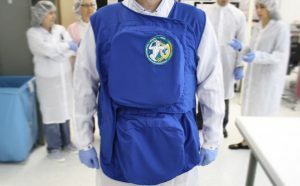 The garment has been manufactured with internal compartments for containers to be filled at need with the water available on board the International Space Station: when garment containers are full, they provide a protective layer for radiation shielding against protons emitted in SPEs, reducing the amount of energy deposited by the radiation in the most sensitive organs. For example, it is of utmost importance to ensure protection to the red bone marrow, responsible for the production of blood cells, whose damage can have dangerous and immediate consequences for astronauts’ health. Through the choice of water as shielding material, the design meets the need of maximum utilization of the resources already present in a space habitat, avoiding additional costs and logistic problems related to the launch of material intended for the sole purpose of radiation shielding. Together with the garment, a flexible water container has been qualified for launch filled, and the container material is undergoung tests for its suitability to preserve the characteristics of drinking water. The PERSEO demonstrator – Radiation Shield Demo – is a garment, made of NOMEX® (a tissue of common use in space environment), with interior slots for water containers made in Coretech®. Water is distributed in 4 containers, interconnected with each other so that the use of a single water interface is possible. Two containers are protecting the astronaut’s lower and upper back, and two his chest and abdomen. The total water allowance is of about 22 liters, and all containers, when filled, offer a protection layer of 7 cm thickness. The on-board experimental session was successfully carried out by ESA astronaut Paolo Nespoli on the 7th of November 2017. 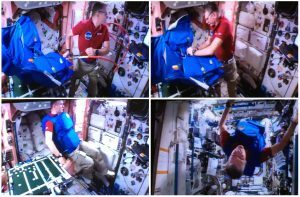 The astronaut filled the garment by connectng it to the ISS water dispenser, and then worn it in the filled configuration, verifying the comfort and quality of the design of the demonstrator. The water was then drained back in the ISS water recovery system without water waste. The astronaut finally filled a questionnaire, giving feedbacks on wearability and on the practicality of the filling and draining procedures. Current strategies for the risk mitigation from cosmic radiation involve the use of thicknesses of shielding materials, distributed outside the space habitat, together with the realization of internal shelters, habitats or areas with a higher level of shielding. This implies that, for example in the event of an intense solar event (SPE, Solar Particle Event), the astronaut could be forced to take refuge in a shelter, risking to be confined in a small volume for long periods of time. In this situation, a personal radiation protection system as the PERSEO garment could ensure the astronaut the possibility to leave the shelter (albeit for a limited period of time), for example to make interventions that may be necessary because of the solar storm itself, as in case of damages to electronics due to radiation. In addition, in the design of inhabited structures on the lunar surface or in future trips to the NEOs (Near Earth Objects) studied by space agencies, the non-availability of large volumes could make radiation protection strategy based on the presence of a shelter not feasible at all. It is therefore necessary to explore complementary or alternative strategies, and optimal solutions are those which, as PERSEO, are based on the use (and not consumption!) of already available resources or waste materials. In this sense, the qualification for the launch of a container, full of water, and the subsequent analysis of the water contained after return to earth holds a role of crucial importance. If it will be shown that the material of the container is able to keep the drinking water without causing alterations, its use could be foreseen in the future for the realization of devices as garments or e.g. sleeping bags, to be filled with water, serving at the same time as systems for the storage of drinking water and personal radiation protection systems. 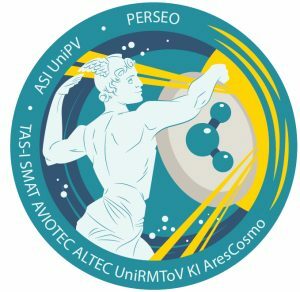 For a detailed report on the PERSEO project development and outcome, see our paper published in Life Sciences in Space Research. Also see here for a collection of presentations, press articles and website links reporting on the development and outcome of the PERSEO project.